Billboard has officially released its sales tally for last week, Eminem dusted off the competition. 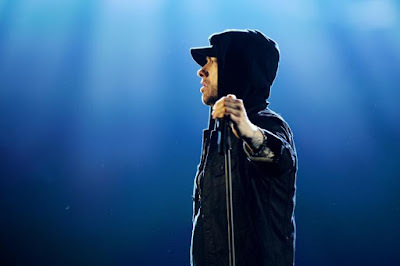 In fact, Eminem's numbers for Kamikaze were so good they exceeded the revised total of 400K sold by about 34,000 equivalent units, 252,000 of which represented traditional sales figures (actual purchases). By comparison, Eminem's last album Revival sold 267,000 units when it debuted at no. 1 on the Billboard 200. Kamikaze represents Eminem's ninth album to climb as high as no. 1 on the Billboard 200. Only his major label debut The Slim Shady LP failed to hit no. 1, and only by the narrowest of margins. He now shares the distinction of nine no. 1 albums with Garth Brooks and The Rolling Stones, good for 5th place all-time. Only The Beatles, Jay-Z, Bruce Springsteen, Barbara Streisand and Elvis Presley stand in his way.